Windows Easy Transfer is a great tool for migrating data from one computer to another. 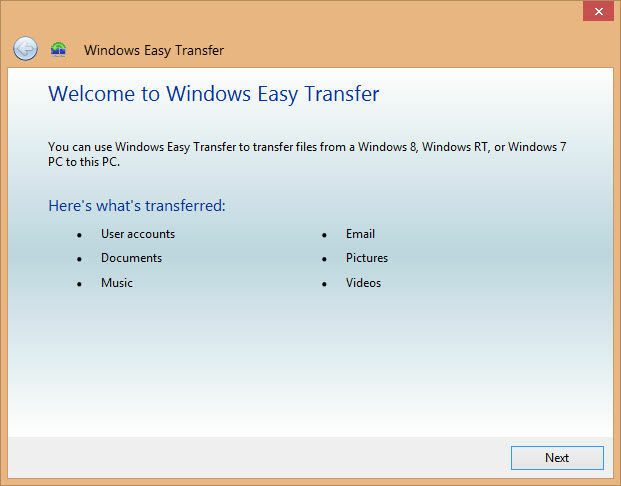 Windows Easy Transfer is a built-in tool in Windows 7 and Windows 8 and you can download Windows Easy Transfer for Windows XP and Windows Vista from Windows Easy Transfer site. The limitation of Windows Easy Transfer is that it is only limited to a few Windows settings and important data like user documents, email, pictures, documents and videos. These will only be transferred if they have been placed in their default locations. There is no way that we can transfer third party programs and their settings. This is where IObit PCTransfer comes in. IObit PCTransfer makes migrating to a new computer a whole lot easier with a lot more options on offer than the default Windows Easy Transfer. While you can add custom files and folders to the transfer, there’s a lot of built-in data types that can be transferred in a single click. These include music, videos, emails, Skype chat data, downloads, IObit products settings (if you’re using any), Desktop items, browser settings and bookmarks, documents etc. When you open the program, there are two side tabs, backup and restore. 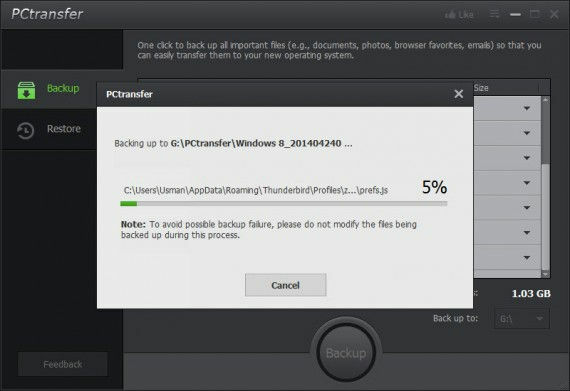 Backup is selected by default. You will be able to select the items that you want to backup. The backup location can only be set to a drive. You can’t select a folder to save the backup. 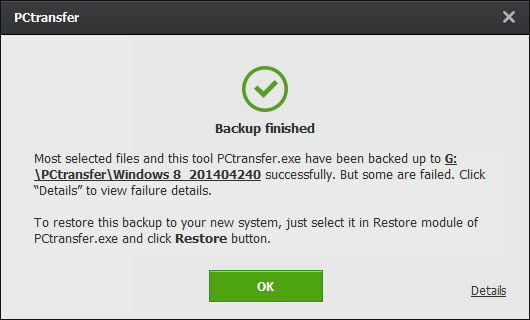 Once you’re done with selecting the files and folders to backup, you can simply hit the backup button to start the backup process. Please note that if you have selected the browser settings and bookmarks, IObit won’t be able to back these up in real-time if any of the browser is open while the backup process is running. So you will need to close all browsers in order to backup their settings. Once backup job is finished, you will find a folder called PCTransfer in the drive that you selected for backup. All the backed up data will be saved in this folder. You will need to copy this folder to the new computer where you want to restore these settings and data files. There is no need to install IObit PCTransfer on the destination computer. You will only need to run PCtransfer.exe file inside PCTransfer folder to restore the all the backed up content. Please note that although IObit PCTransfer can be handy, it is still limited in the sense that it only transfers a limited amount of programs settings and data. If you are looking for a comprehensive migration solution, you may take a look at Laplink PCMover or O&O Migration Toolkit.